Dr. Kunwar is a graduate from Lake Erie College of Osteopathic Medicine in Bradenton, Florida, class of 2010. He was thereafter accepted by the Northside Hospital Internal Medicine Program, in Pinellas Park, Florida, and graduated this in 2013. Upon completion of Residency, Dr. Kunwar joined his Family’s Medical Practice: 53rd Ave East Medical, in operation for 30 years, with Dr. Padmini Rajan, Mother in Law, the practicing Physician. He staffed the Sarasota Clark Rd. office for apprx. 4 years. Dr. Kunwar has experience in all matters of Primary Care Medicine, and practices Evidence Based Medicine. He believes in a holistic, whole body approach, with a least invasive philosophy at all times. Dr. Kunwar has a Bachelors of Lab Science, and a Masters Degree in Molecular Biology, both of which are applied to Medicine’s growing treatment approach to targeted molecular therapies. Presently, Dr. Kunwar is a part time Teaching Physician at Lake Erie College of Osteopathic Medicine, Bradenton. As well, currently serving as Medical Director for DocACO, Bradenton. 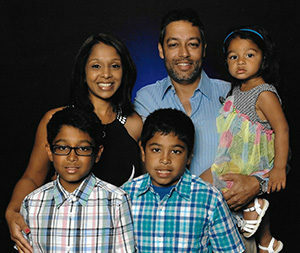 Born and raised in Philadelphia, Dr. Kunwar now lives with his wife Anita and three children, Dhaven, Rithik, and Kareena in Lakewood Ranch, Florida.